As we all know from living in Southern California, LA traffic jams can make driving very slow. We offer multiple locations throughout greater Los Angeles for our students’ convenience. For more information see our Multiple Location page. Below is an article from Curbed Los Angeles which lists Los Angeles as having the most traffic congestion of all cities in the United States. “Los Angeles’s terrible traffic has once again generated national recognition. 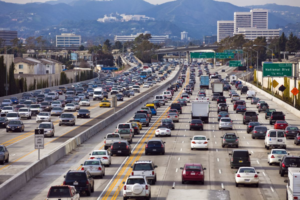 A report released yesterday from traffic data firm INRIX says that out of the 25 most congested cities in the nation, LA has the most traffic “hotspots”— areas where traffic frequently jams. The firm identified nearly 10,400 traffic trouble spots around LA, but the honor of Los Angeles’s worst traffic zone went to a stretch of the northbound 405 between exit 43 and exit 21 (from the South Bay to the edge of Orange County), which saw saw over 2,000 traffic jams in two months, according to INRIX. Also in the top five: the southbound 405 from exit 22 to 45, and a section of the southbound 101 that connects the Valley to Downtown—from exit 3B to the 134/170 interchange. Nationwide, LA dominated the list of gnarly traffic-jam zones: 10 of the 25 nastiest traffic spots in the country were in LA, the report found. The ranking was determined by factoring in “the duration, length and frequency of traffic jams” in these cities. Though New York had a higher number of traffic problem areas overall, LA captured the top ranking “due to the severity as well as the high number” of trouble spots for traffic.